A FN fans web stop updating?! 聖境傳說 Fans 網站" 電玩研究苑" 即將停止更新?! 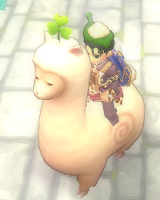 Have you ever notice "Grass Mud Horse" which is main ride in Finding Neverlannd online-game? In recently , a fans web site created by ekelly announced : this web site will not update anymore. Today (3/13), the news was forwarded to Bahamut forum. The conflict comes from "COPY" issue. MeetGee may take a legal action in second "COPY" issue. In the meantime, ekelly decide to stop updating his website. Being a player / fan, it's hard to compare with company in financial or legal capability. It also common to see articles with one's emotion in fans website. because game companies always get the greatest power. Can these such conflicts be solved in more peaceful ? To Compare with BZ's Fansite, How sarcastic it is!